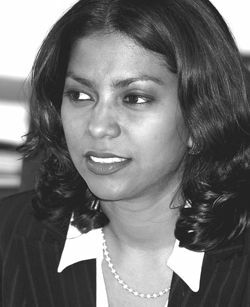 Acting Chief Magistrate, Sharda Sinanan-Bollers may have found the solution to set this nationâs youth on the narrow path and on the right side of the law. âThe youth are doing the most undesirable things. It seems like the only way to curb the problem of young people coming to court with weed is to give them a suspended sentence,â she said. Bollers was at the time speaking to 16 year old Keniel Daniel of Belair. Daniel was charged on the October 10 for having a bomb of cannabis in his possession at Fountain. The young boy was slapped with a $100 fine to be paid forthwith or in default two days in prison and a two-month sentence suspended for one year. When he appeared at the court he pleaded guilty to the charge laid against him. The court heard that the young lad was seen sitting on the block amongst a group when members of the Rapid Response Unit (RRU) who were on mobile patrol picked up the scent of cannabis coming from where Daniel was seated. A search was conducted on the youngster and a âspliffâ was found in his waist. The officers cautioned him and he replied, âOfficer give me ah chanceâ.